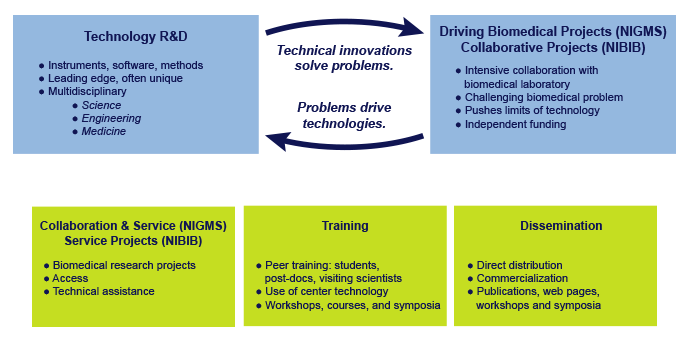 The Biomedical Technology Resources at NIGMS and NIBIB create critical, often unique technology and methods at the forefront of their respective fields and apply them to a broad range of basic, translational and clinical research. This occurs through a synergistic interaction of technical and biomedical expertise, both within the centers and in intensive collaborations with other leading laboratories. Synergy between technology development and biomedical research is an important driving force. A primary mission of the BTR program is to help the research community use the technologies it is developing. Through BTRs, researchers can access advanced instrumentation, software and support. Potential interactions include long-term collaboration, routine analysis or consultation. Biomedical Technology Resources also provide hands-on laboratory training, short courses, workshops and online resources. Each year, nearly 7,000 biomedical investigators use the BTRs or collaborate on research projects at these centers. Investigators who are eligible to use the resources include those whose projects are supported by NIH, other federal government agencies or the private sector. However, priority is given to NIH-supported researchers. Investigators interested in working with a Biomedical Technology Resource should consult either the NIGMS website or the NIBIB website . Computing and Informatics Technology Centers: These centers develop advanced methods and technologies for biomedical computing and informatics. This includes high-performance computing systems as well as software for complex data visualization and analysis, simulation and modeling of biological systems. The centers make their computing infrastructure and software freely available. Molecular and Cellular Imaging Technology Centers: These centers develop advanced imaging and associated analytical and computational technologies for the anatomic and functional analysis of organelles, cells and tissues. The technologies include a complementary variety of microscopies using electrons or X-rays as the source for tomography and correlative approaches. Mass spectrometry imaging is available to visualize the spatial distribution of compounds, biomarkers, metabolites, peptides or proteins by their molecular masses. Sample preparation is an important component of each of these centers. Structural Biology Technology Centers: These centers develop technologies including spectroscopic techniques, synchrotron radiation and macromolecular microscopy for studying the structures of biomolecules predominantly ranging in size from peptides to very large macromolecular complexes. Detection, data analysis and automation are important components of most of these centers. Systems Biology Technology Centers: These centers support the continued development of advanced biomedical, analytical and computational technologies capable of high throughput and applicable to complex samples and their integration into comprehensive interdisciplinary approaches to various aspects of systems biology. These Centers integrate physical, engineering and life sciences on the design, development and application of biomedical imaging and engineering techniques, devices, computational modeling, health informatics and make these products available to the research community.